I don’t like James Joyce as much as I ought to. It might be because he’s too earthly, too real, too human. Every time his language lifts me into the sky, he’ll say something ordinary or mundane or cheap and I’m back on the ground, wondering why he bothered. But that’s just how humanity is, right? Alternately ennobling and degrading itself. Anyway, the Portrait of the Artist as a Young Man contains a very, very, very insightful conversation between Stephen Dedalus and his friend, Lynch. They’re talking about art and beauty, and it’s cold, and they’re smoking, and I’ve often flipped the book to that chapter to follow them along foggy and curving paths, waiting for my turn to speak. 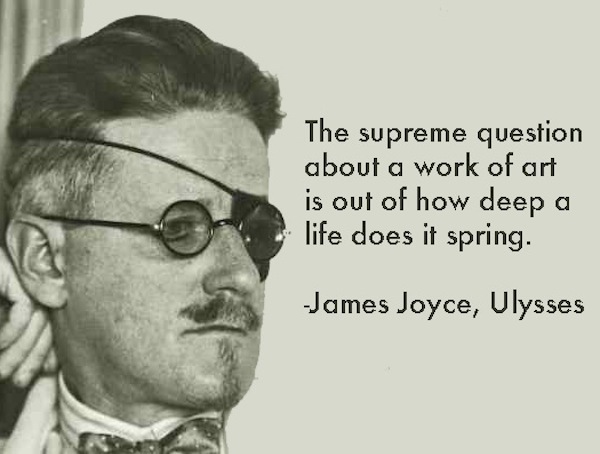 To be fair, this isn’t Joyce’s philosophy of art, but his protagonist’s. Stephen’s aesthetic theory is unraveled and developed while he and Lynch wander around campus, talking and smoking (without me). The sources of the theory are anticipated earlier, when Stephen tells the dean: “For my purpose I can work on at present by the light of one or two ideas of Aristotle and Aquinas.” Stephen reveals that he intends to utilize the two philosophers as a launching pad for his own thought. Later, with Lynch, Stephen begins by claiming that pity and terror haven’t been defined by Aristotle, for whom these emotions are integral components of tragedy. Stephen defines pity as “the feeling which arrests the mind in the presence of whatsoever is grave and constant in human sufferings and unites it with the human sufferer” and terror as “the feeling which arrests the mind in the presence of whatsoever is grave and constant in human sufferings and unites it with the secret cause.” In other words, the observer is moved to pity when presented with suffering which relates him to the sufferer, and he experiences terror when he relates to the cause of suffering. In both cases, the observer understands that he, too, is capable of suffering so. Moreover, it is important to keep in mind that Stephen points out that tragic emotions must be invoked by “whatsoever is constant and grave in human sufferings” – they cannot, and will not, be summoned by chance accidents. Pity and terror, then, are experienced only when the observer relates to timeless, essential human experiences which are manifested by the very nature of the human condition. Aquinas’ three prerequisites for beauty, as translated by Stephen, are wholeness, harmony, and radiance, and these prerequisites correspond to the three steps of aesthetic apprehension. To demonstrate, Stephen asks Lynch to look at a basket. Stephen tells him that in order to see the basket, one’s mind “first of all separates the basket from the rest of the visible universe which is not the basket… the esthetic image is first luminously apprehended as selfbounded and selfcontained upon the immeasurable background of space or time which is not it.” In other words, in perceiving, the perceiver selects the aesthetic object, thereby differentiating it from the rest of the world as separate and complete in itself. This stage of apprehension corresponds to Aquinas’ first requirement of wholeness. Simple enough. Second, one’s mind perceives the aesthetic object “as balanced part against part within its limits; you feel the rhythm of its structure… You apprehend it as complex, multiple, divisible, separable… harmonious.” The perceiver analyses the separate parts of the aesthetic object and concludes that they are balanced, symmetrical, and congruent with one another. This second stage of apprehension corresponds to Aquinas’ second requirement of harmony. So far, the stages of apprehension are almost reminiscent of Hegelian dialectic, although they follow a completely different chronology. Instead of moving from thesis to antithesis to synthesis, Stephen has the perceiver begin at a synthesis wherein the aesthetic object is apprehended completely, then move to an analysis of its constituent parts. Finally, Stephen describes beauty as it is understood “in the marketplace,” where the image of the aesthetic object is “set between the mind or senses of the artist himself and the mind or senses of others.” Here, Stephen makes the delineation between any perceiver of beauty, and the artist. The artist, who presumably exists “in the marketplace” because he is a producer, must re-create the tripartite aesthetic experience for an audience. This re-creation can take three possible forms: “the lyrical form, the form wherein the artist presents his image in immediate relation to himself; the epical form, the form wherein he presents his image in mediate relation to himself and to others; the dramatic form, the form wherein he presents his image in immediate relation to others.” The lyrical form of art is simply an expression of individual, personal experience, or “the simplest verbal vesture of an instant of emotion.” The epical form of art expands upon the lyrical; after critical reflection upon himself as the center of an event, the artist distances himself from the event such that its “emotional gravity is equidistant from the artist himself and from others” and the audience, too, may be emotionally affected by it. The dramatic form of art is achieved when the vitality of the artist grants each fictional character a life of their own until “the personality of the artist… finally refines itself out of existence, impersonalizes itself… The mystery of esthetic like that of material creation is accomplished.” In other words, the artist assumes a godlike role, who ultimately becomes and remains detached from his creation.